One of the most epic battles we wage as parents, is the war against clutter. There’s so. much. stuff. EVERYWHERE. And unfortunately for us, our little ones probably aren’t very good at cleaning it up on their own. But that doesn’t mean hope is lost. There are some great preschool and toddler room cleaning tips that can help you keep your sanity. And keep their rooms clean. Here are seven of our favorites! Leaving the house is always a struggle, and that’s often because my kids are playing and having fun. I’m busy getting us ready to leave the house so the playing is usually helpful. As such, they play until the moment I start screaming that it’s time to put on shoes. We leave behind a graveyard of toys. Do this a few times a day and the mess compounds and compounds and eventually it’s too overwhelming for even a grown up to organize – let alone a 4 year old. Now, before leaving the house, we set a timer. And when Alexa announces that it’s time to clean up, we stop playing and know that we have ten minutes to tidy up before we have to leave. Sometimes we finish early and I don’t even have to scream about the shoes! But the expectation is clear: we tidy up before we move on to the next activity. This is similar to the routine at preschool, and if it works there, it can definitely work at home as well. My kids love a challenge. They also love proving me wrong. So when I say, I bet you can’t clean up all the Legos in sixty seconds? Game is ON. I’ve never seen my son move so fast. To add some fun to the game, I close my eyes (sort of), count slowly, and sometimes do a little heckling. 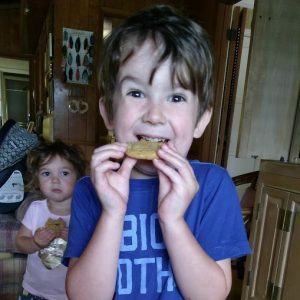 Have kids that are competitive with each other? Even better! “Who Can Put Away More Books” is a favorite around here, and Cole and Evie take turns winning that one! This helps keep cleaning fun – or at least less miserable – and gives some speed and urgency to an otherwise dreary task. Make sure there’s lots of hype and excitement though, or the race could end up being a dud. When I think about everything I have to do to get my chores done – laundry, dishes, prep dinner, vacuum, sweep – it can be completely overwhelming. It’s when I think about everything that I’m most likely to shut down, throw myself on the couch and eat a bag of chips to cope. Well, for kids, cleaning their rooms can create the same feelings. So much like I need to break down my chores into manageable tasks, I need to help my kids learn how to do the same. When there are blocks and trains and Legos and dinosaurs and stuffed animals and books strewn all over a room, my son hardly knows where to start. Pick one item and get that organized first. Then take on another offender. Then another until you’re done. Eventually, your kids will learn the skill of compartmentalizing their tasks and be more well equipped to do this on their own. Sometimes we need to do a bigger cleaning. My husband will get in a cleaning mode and could easily – and happily – clean the kids rooms for hours at a time. He also doesn’t realize that they just are not equipped to participate in any activity for that kind of length of time. Let alone one that they hate. Pick a time that is reasonable for your child. Make this time shorter in the beginning as you’re adding this to your routine, and increase it as you’re able. Once the timer goes off, you’re done. Even if you’re not finished. Get the kids outside to play. Reward them with a show. Allow a little extra screen time. Sometimes even changing their chore will be enough of a break! If you’re on a big cleaning day, perhaps having them sort laundry or wash windows would feel like a novel activity for them. Once they’ve gotten a sufficient break, you can go back to resume cleaning their room. Set another timer, and repeat until the room is clean. Just make sure to sneak some fun in there too! Cleaning doesn’t need to feel like a punishment. We may want it to feel like a punishment for allowing their rooms to get so out of control in the first place, but it doesn’t need to. Play some of your kids favorite tunes so they can whistle while they work. Or go for something festive like The Flight of the Bumblebee to really get them moving! It adds some life to the dull activity, and might just make it more enjoyable for you as well. Look, a little bribery never killed anyone. And this kind of bribery is really more like a reward for a job well done. If I get my whole house cleaned, maybe I treat myself to an afternoon coffee. Or a few minutes of relaxing and doing NOTHING but watching trashy TV. So if it helps, don’t think of it as bribery. Think of it as teaching your kids the benefits of providing themselves incentives. Incentives like a chocolate chip cookie. Because if they really did a job well done? Then they deserve it! Sometimes there’s just too much stuff. And no matter how many timers you set or how much music you play, it’s impossible to keep up. When that’s the case, there’s only one reasonable option: Sneak into their rooms when they’re gone and “retire” a bag of toys. If you’re worried that you’re going to accidentally take away something so incredibly beloved that your child will have a lifelong trauma, you can hide the bag in the garage. But I’m happy to tell you that more often than not, the kids don’t even notice what’s missing! This is especially effective for things like McDonald’s toys, figurines that aren’t played with, and everything you’ve ever received in a goodie bag from a kid’s birthday party. 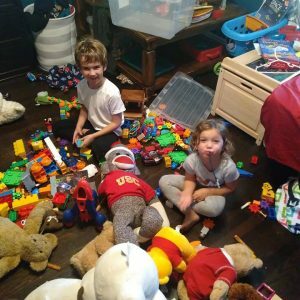 In the interest of full disclosure – kids are little jerks sometimes, so you may try all of these things and find that the playroom still looks like an abandoned preschool. But don’t be discouraged! Keep it up, keep trying, and eventually, you’ll see improvement. If nothing else, at least you can keep throwing things out when they’re not looking! Want more helpful parenting tips from The Salty Mamas? Check out these tips and hacks! Previous Post: « How to Keep a One Year Old Busy! GUARANTEED!